A star found spinning more than a thousand times every second is thought to be the fastest rotating star known. The neutron star is a burned out corpse that's collapsed into an incredible density rivaled only by black holes. It packs the mass of the Sun into a sphere the size of a city. It has been reduced to nothing but tightly huddled neutrons. A thimbleful would weigh a hundred million tons back here on Earth. The neutron star rotates rapidly because, like a skater pulling her arms in, all its momentum is now highly concentrated. The tiny but mighty star siphons material from a larger companion. Every now and then, a coating of the material ignites a thermonuclear explosion on the neutron star, and X-rays are released [image]. Using the European Space Agency's Integral satellite, astronomers watched these emissions to measure the spin rate of the star, catalogued as XTE J1739-285. It is zipping around on its axis 1,122 times every second. That smashes the previous record of 760 spins per second for a neutron star. "It was quite a surprise to us," said ESA scientist Erik Kuulkers. More observations are needed to confirm the new speed record, however. "Our detection is just above the level where we think there is something real," Kuulkers said. "We definitely need more observations. If we see the signal again, then everyone will believe it." There's a limit to how fast stars can spin. Too fast and they'd break apart. But since astronomers don't know the exact make-up of neutron stars, the speed limit is not known. 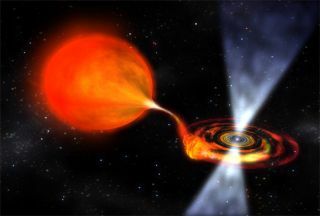 "If we can find more stars that spin in this range, it will certainly allow us to exclude some models of their interior structure," Kuulkers said. Last year astronomers clocked a black hole spinning 950 times per second. The Sun, for comparison, spins on its axis once every 25 days as measured at its equator. Editor's Note: This article has been corrected to state the accurate number of days it takes the Sun to rotate at its equator. At higher latitudes the rotation rate is slower, and at the poles it is about 35 days.